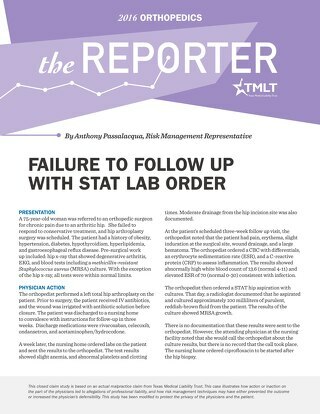 The EMS records reflect that patient’s chief complaint at the scene of the accident was “my leg hurts.” The presumptive diagnosis from the EMS operators was possible leg injury with loss of consciousness. The patient’s size (6'2'' and more than 300 pounds) prohibited EMS from being able to fit him with a cervical collar. The patient was taken to the emergency department (ED) at a Level 1 trauma center. He was evaluated by an emergency medicine physician, two trauma surgeons, and Orthopedic Surgeon A. The following film studies were obtained: pelvic x-ray; chest x-ray; CT scan of the chest, abdomen and pelvis; follow-up chest x-ray; CT scan of the cervical spine; CT scan of the head; x-ray of the right knee; and x-rays of the lumbar spine. Notably absent in the list of film studies was film of the femurs. The patient was diagnosed with contusions, acute back pain, rib fractures shown on x-ray, and a sprained right knee. He was discharged later that day and directed to see the orthopedic surgeon at his clinic for follow up. 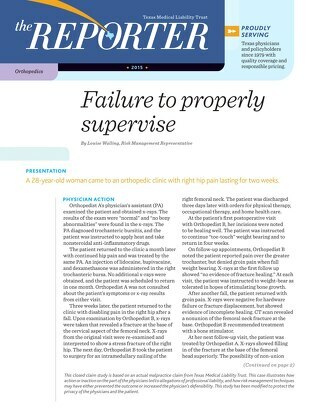 Two days later, the patient saw Orthopedic Surgeon B for knee sprain. Orthopedic Surgeon B did not have privileges within the system affiliated with the Level 1 trauma center. 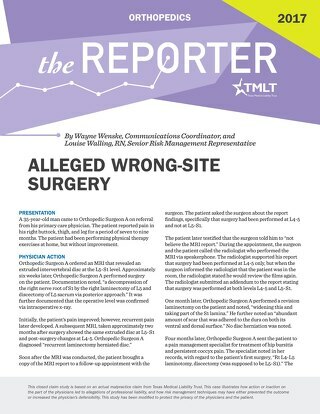 Therefore, he did not have access to the patient’s trauma center chart or the radiographic studies. 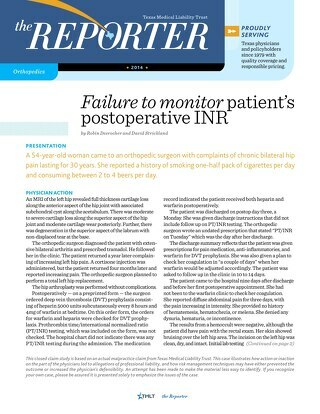 The patient came to Orthopedic Surgeon B wearing a knee brace, which was removed for the examination. Orthopedic Surgeon B focused the exam on the right knee, but the exam was limited due to patient discomfort and the size of the patient’s leg. Orthopedic Surgeon B recommended an MRI and diagnosed an acute sprain with a possible non-displaced fracture of the right knee. The patient never complained about his thigh or leg pain. The MRI was performed the next day, but it did not extend high enough to detect a fracture of the femur. 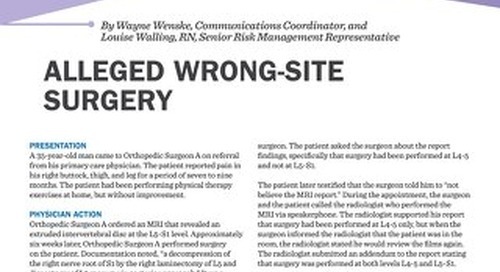 Orthopedic Surgeon B saw the patient six weeks later for follow up. 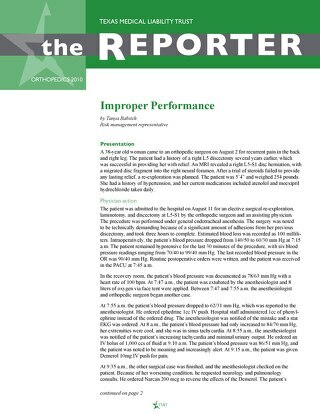 The patient was continuing to perform home exercises and he was increasing his weight bearing status and ambulation. He was next seen two weeks later, at which time Orthopedic Surgeon B wrote a prescription for outpatient physical therapy to work on range-of-motion and quadriceps strengthening. He recommended that the patient use a cane, not his crutches, to assist with ambulation. Physical therapists worked with the patient for seven months for a total of 75 visits. Nine months after first coming to Orthopedic Surgeon B, the patient first indicated that he could feel a large firm mass in his right thigh. Orthopedic surgeon B obtained x-rays that revealed evidence of a femur fracture. The fracture was located in the mid-shaft and had developed a great deal of callus formation as the bones overlaid each other. This caused the right leg to be shorter than the left leg. 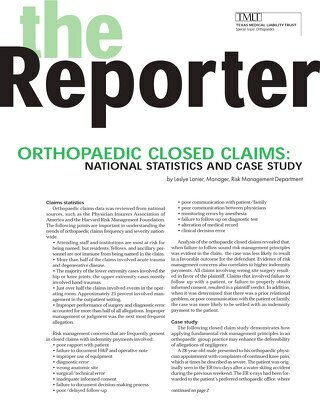 Orthopedic Surgeon B referred the patient to Orthopedic Surgeon C, who specialized in abnormal bone cases often associated with orthopedic oncology. Orthopedic Surgeon C performed a total of five procedures to resect callous formation, realign the femur, remove ORIF hardware, and place an expandable nail. The patient missed little time from work during this process and continues to work as a high school basketball coach. 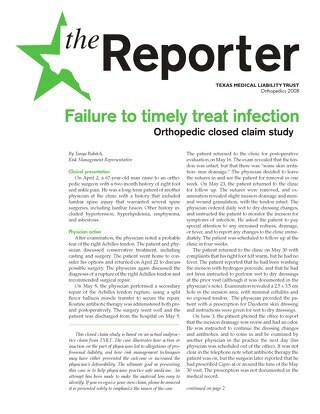 Lawsuits were filed alleging that the emergency medicine physician and Orthopedic Surgeon B failed to timely diagnose and treat the femur fracture. 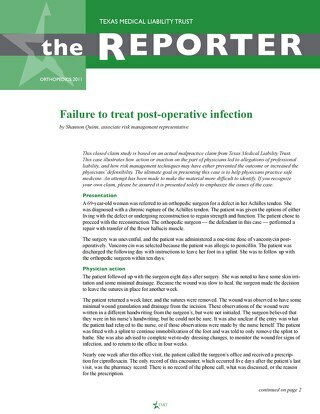 The patient claimed the delay in treatment necessitated an extended healing process, multiple surgeries, subsequent infections, and prolonged pain and suffering. Two orthopedic surgeons reviewed this case for the defense. Each expressed concern about the delay in diagnosis. 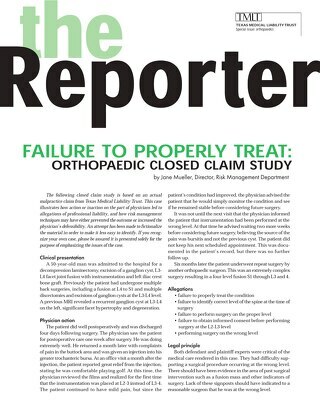 The plaintiff retained an orthopedic surgeon and an emergency medicine physician to criticize the delay in diagnosis and treatment, as well as the ED physician’s failure to diagnose the fractured femur. The case was settled on behalf of the orthopedic surgeon. 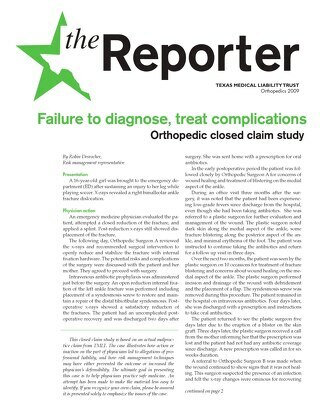 Orthopedic Surgeon B did not request the medical records or imaging studies from the trauma center. 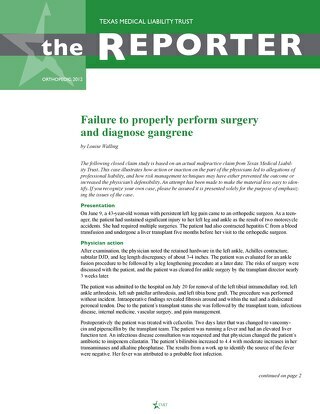 Relying on the patient to convey the findings from emergency and trauma physicians, as well as a series of imaging studies, can be problematic. 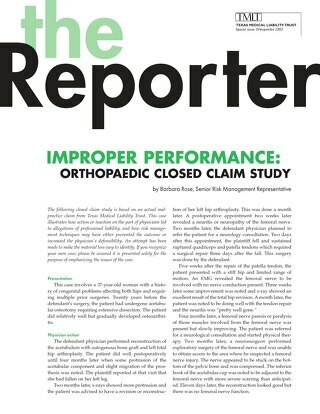 Even if a physician suspects an injury beyond the chief complaint, he or she may have believed “everything else was normal” without knowing what was actually imaged. If physicians cannot view electronic records and images remotely, they should consider requesting the records. When following up on a patient involved in a trauma, a thorough exam and review of systems may be indicated for the initial exam. 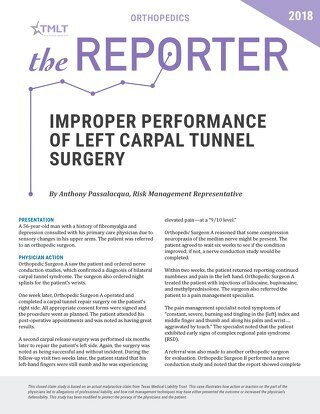 Complete documentation of each patient encounter is important, including complaints the patient may have beyond the primary focus of their injury. One of the defense experts stated that the first exam could have involved measuring both legs and palpating and thoroughly examining the entire injured leg. If an exam did not reveal the injury, it would have made the physician’s care more defensible. 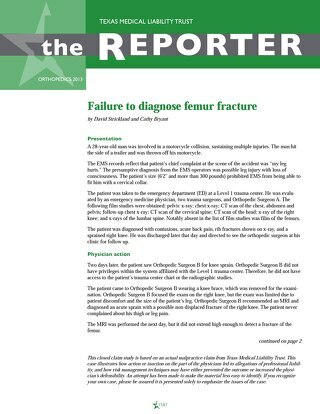 Ordering the appropriate films to augment the exam may also have identified the fractured femur. The defense expert added that the patient’s abnormally slow progress may have also led to an earlier diagnosis of the fracture.